An innocent Canadian citizen has been wrongly incarcerated by foreign powers and torn away from his family, but our country's leader seems unfazed. The enforcement of emergency legislation is the state's most typical response to acts of "terror." Under such conditions, laws swiftly turn draconian. Rational debate and standard procedures are eclipsed as governments seek to quell the public's horror over devastated human life. Civil liberties are sacrificed as authoritarian rule trumps justice -- and this in the name of "national security." Wishing to be perceived as "tough on crime," those in power override legal protocol, create human scapegoats for political capital and run roughshod over the lives of innocent people. The flagrant persecution of Hassan Diab, a Canadian citizen caught in the crosshairs of international politics, captures the legitimized violence embodied in the nation state. 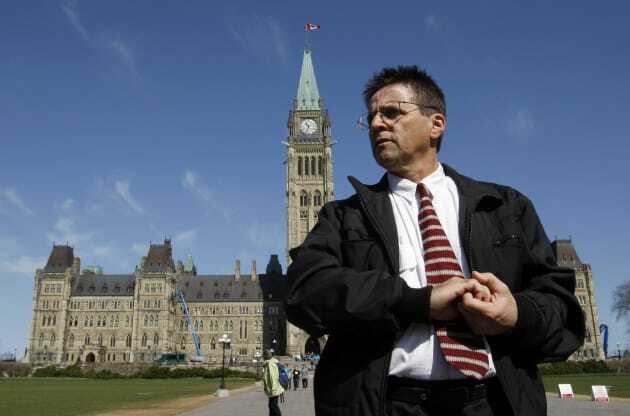 Ottawa professor Hassan Diab leaves the Parliament Hill following a news conference in Ottawa April 13, 2012. Harassed since 2007 by state authorities and journalists, Hassan Diab, a sociology professor at the University of Ottawa, was falsely accused of involvement in the 1980 bombing of a synagogue on Copernicus Street in Paris. Extradited to France in 2014, he now languishes interminably, and without charge or trial, in a French jail. Over the past few years, evidence of Diab's innocence has been confirmed repeatedly. Yet, his release from prison has been systematically and arbitrarily stymied. "On 24 April 2017, French investigative judges ordered Mr. Diab's release on bail for the sixth time, citing evidence that indicated that Mr. Diab was in Beirut during the Paris bombing..." And "each time that Mr. Diab had been ordered released, the Court of Appeal quashed the release orders after appeals by the prosecutor." These men have made the innocent Diab pay a colossal price for their political charade. New evidence, from independent witnesses, reveals that Diab was writing exams in Lebanon during the Paris incident. The alibi, along with much other compelling material, irrefutably confirms Diab's innocence. And yet, Diab remains behind bars, his release being thwarted by French officials who seek to raise their country's punitive fist in the face of terrorism. These men have made the innocent Diab pay a colossal price for their political charade; they have violated human rights norms, according to Amnesty International, and made a mockery of France's court procedures. Diab's case is among the most flagrant miscarriages of justice and deemed unprecedented in France's history. Singular as it is, it is uncannily reminiscent of the Dreyfus affair, the case of French artillery captain, Alfred Dreyfus, who, due to rising European anti-Semitism, was "falsely convicted of passing military secrets to Germans" in the 1890s. Today, Dreyfus's ghost returns in the guise of a scapegoated Muslim: a casualty of anti-Arab racism. The former head of Amnesty Canada, Roger Clark, has not hesitated to note that the travesty engulfing Diab is the consequence "of widespread Islamophobia." Compounded with such xenophobic angst is France's fear of appearing "weak" in the face of terrorism. Yet as French authorities don the cloak of discipline and severity, mercilessly punishing the wrong man, they yield, in craven weakness, before the crime of injustice, allowing it to proliferate unchecked. On June 15, 2017, Amnesty International addressed a letter of great urgency to Foreign Affairs Minister Chrystia Freeland, Justice Minister Jody Wilson-Raybould, and Parliamentary Secretary Omar Alghabra, requesting that "the Canadian government advocate for Hassan Diab's release on bail without any further delay." More than 10 days have now elapsed and the government has yet to respond. An innocent Canadian citizen has been wrongly incarcerated by foreign powers and brusquely torn away from his beloved family, but our country's leader seems aloof and unfazed. While in opposition, Mr. Trudeau said that now-former Prime Minister Stephen Harper "has an obligation to use the full force of the Prime Minister's Office to help Canadian citizens when they are unjustly imprisoned abroad." Today, this same Mr. Trudeau is unconscionably silent. Today, this same Mr. Trudeau is unconscionably silent. Countless organizations and public figures have expressed their alarm, urging Mr. Trudeau to deploy his powers to extricate Diab from a Kafkaesque nightmare. But the Prime Minister has yet to act. Known for exhibiting his strength in physical combat, he has yet to flex his political and moral muscle before his French counterparts. Canadians are waiting and the clock is ticking. If anniversaries are occasions for celebration, they are also moments for self-reflection and stock taking. Canada's 150th is an illustrative example: the Liberal Government's egregious neglect of Hassan Diab will leave an indelible scar on our nation's history. Should the ministers responsible not move expeditiously on this grave matter, future generations may look back, aghast at the crying irresponsibility of those in power, who sacrificed a Canadian citizen at the altar of international diplomacy, and allowed the political actors of a foreign state to trample over human rights and civil liberties.